Hover over the image to pin it to Pinterest for later! Even though Scotland can often be overcast, the lack of sun doesn’t do anything to take away the allure. Supposedly the landscapes alone make it worth the trip. I have heard them described as awe-inspiring, powerful, and even spiritual. The country’s crumbling ruins interspersed throughout the landscapes truly move travelers (Um, yes please). I think these photos speak for themselves. Sidenote – Have any of you men been there? Or girls had husbands/boyfriends that went? Thankfully my husband is willing to go, but Scotland is NOT his first choice. UPDATE: Sign up here to stay up to date with out travels. Scotland trip is coming soon!! Glencoe mountains in the Scottish Highlands. 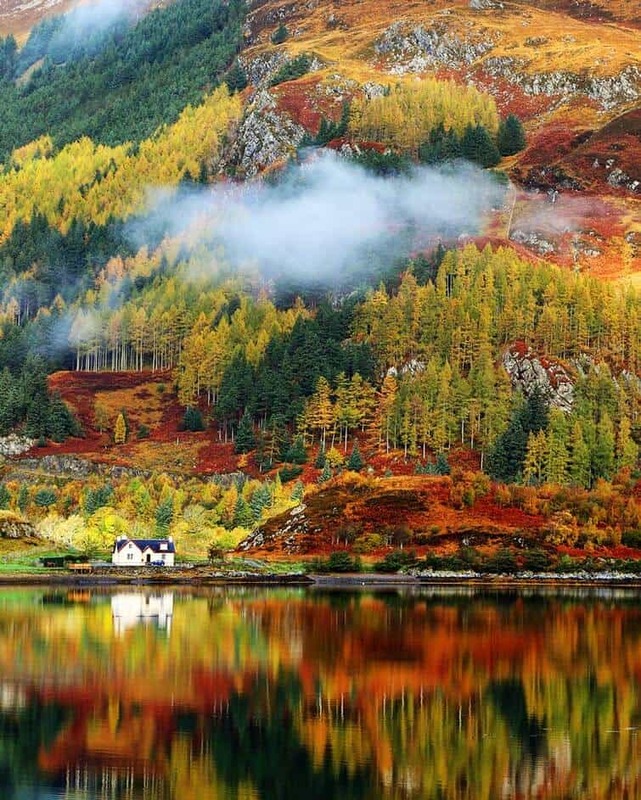 Gorgeous autumn colors in the Highlands. Oh what I would give to live in that house! Hover over the image to pin it to Pinterest. 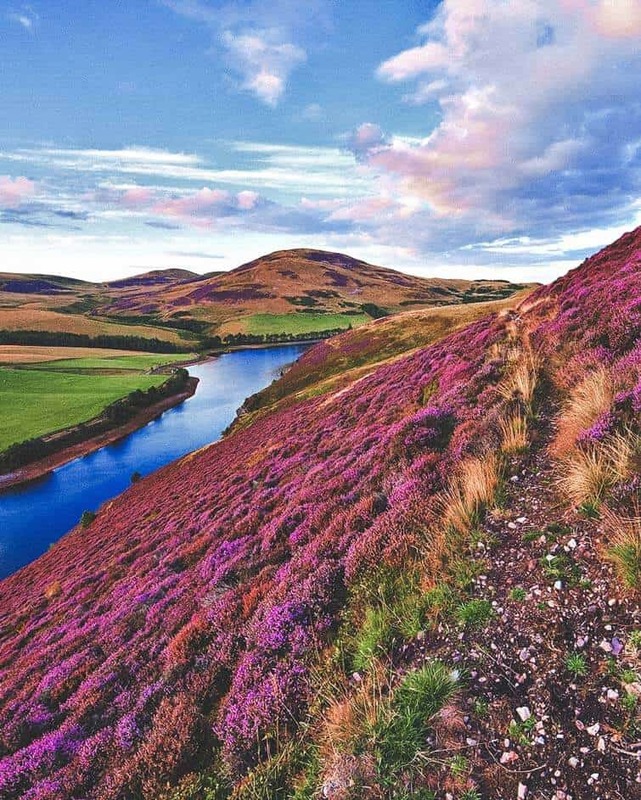 The green valley river mountains in the Pentland Hills covered by violet heather flowers. 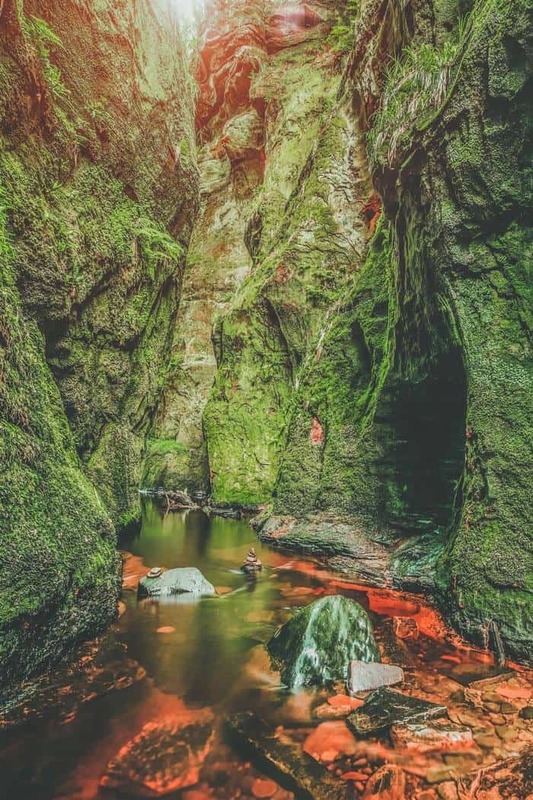 Finnich Glen and the Devil’s Pulpit. Edinburgh castle (purple lights) and the cityscape at night. 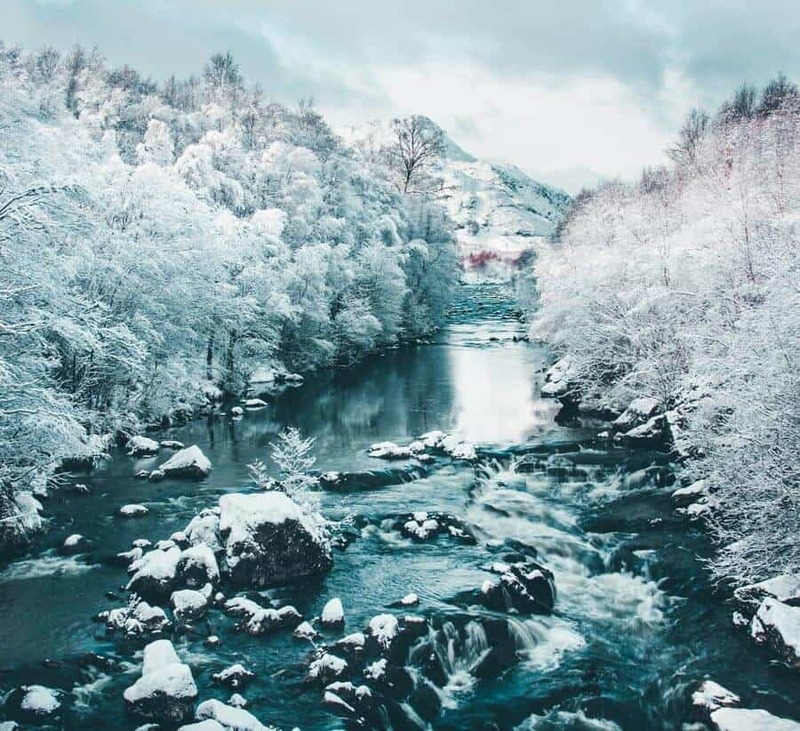 The Claunie river in Winter after a snow fall. 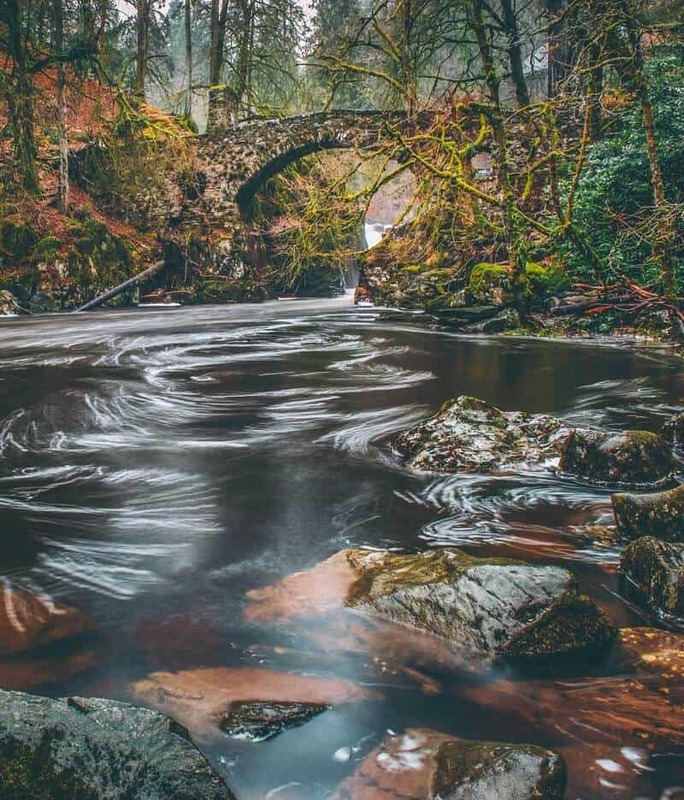 The Hermitage Bridge near Dunkeld Scotland. Glenfinnan Viaduct is a rail bridge in Glenfinnan, Lochaber. Hover over the image to pin it to Pinterest! 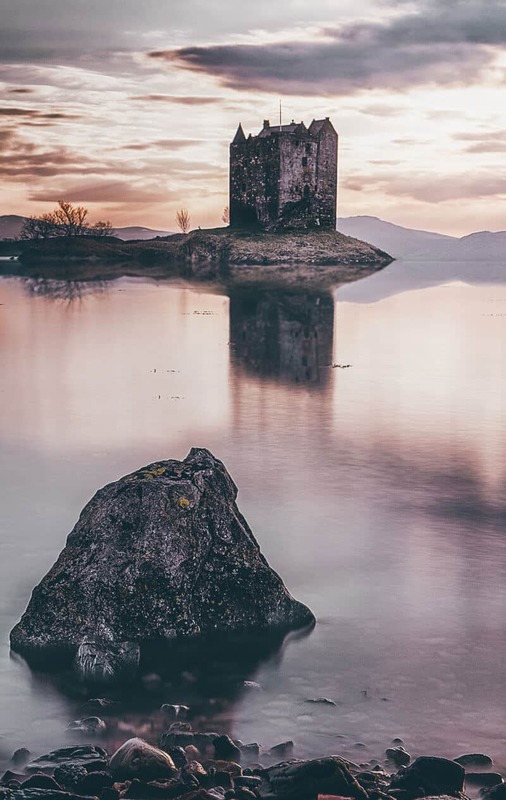 Stalker Castle, one of my favorites! Love finding new castles to explore? Check out 20 of the most beautiful fairy tale castles in the the world! 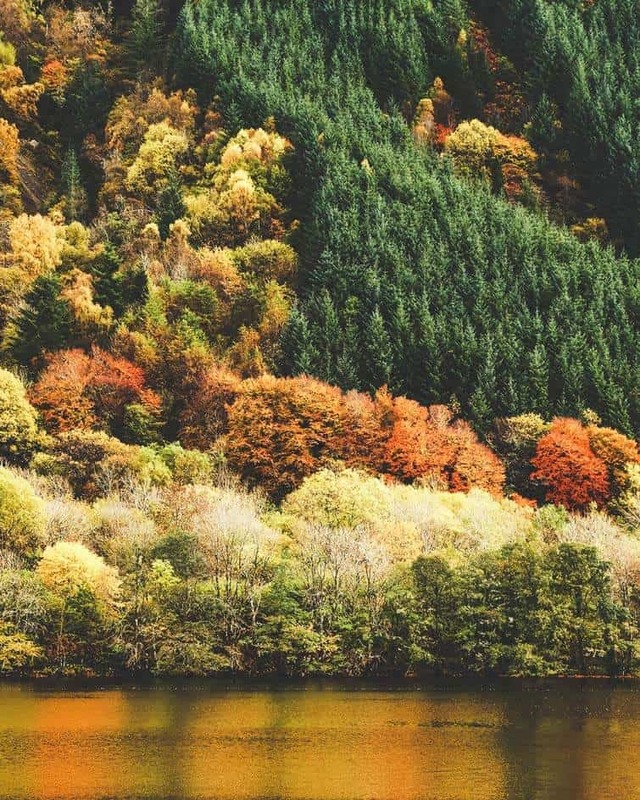 Autumn view of the magic forest on the shores of Lochness. Old Man of Storr, Isle of Skye, Scottish Highlands. Even the beaches are incredible in Scotland! 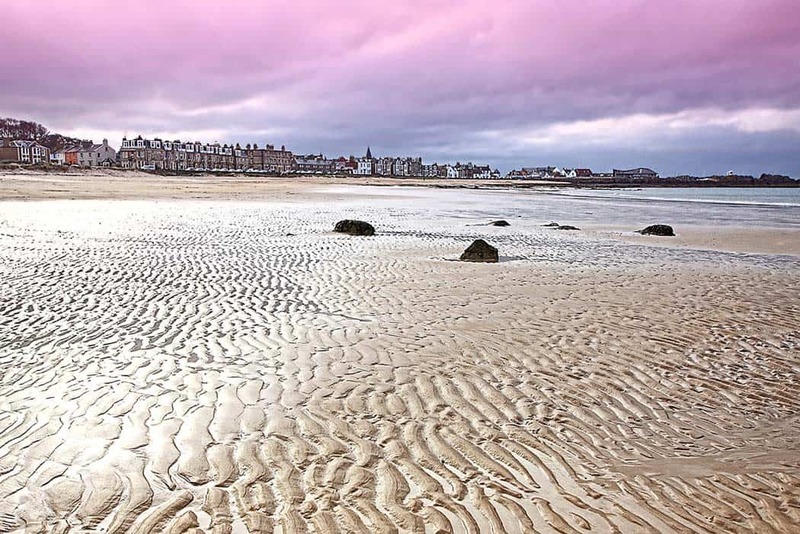 The beach at North Berwick, East Lothian. 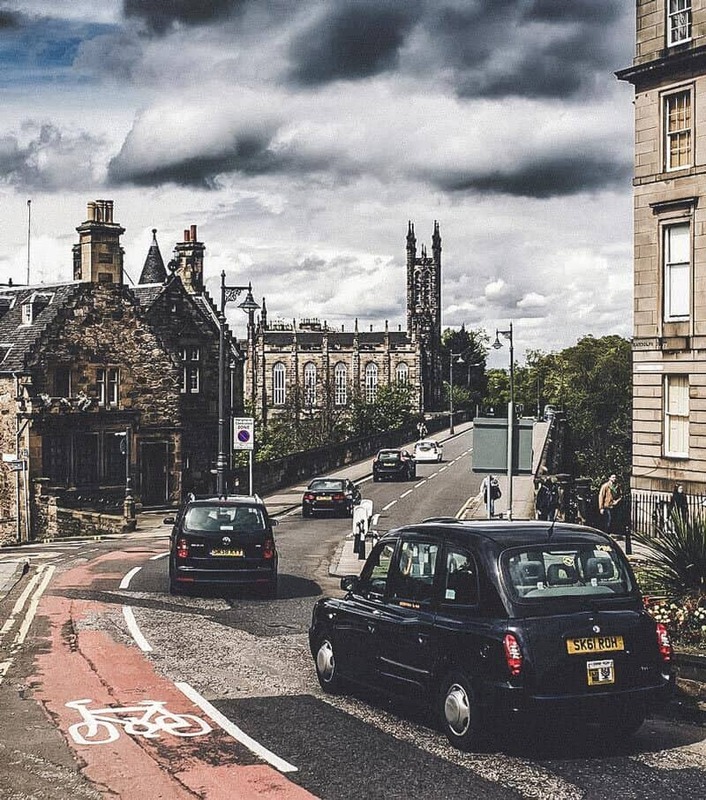 Street view of Edinburgh, the capital of Scotland. Lochness in the highlands (sorry, no monster in this picture). 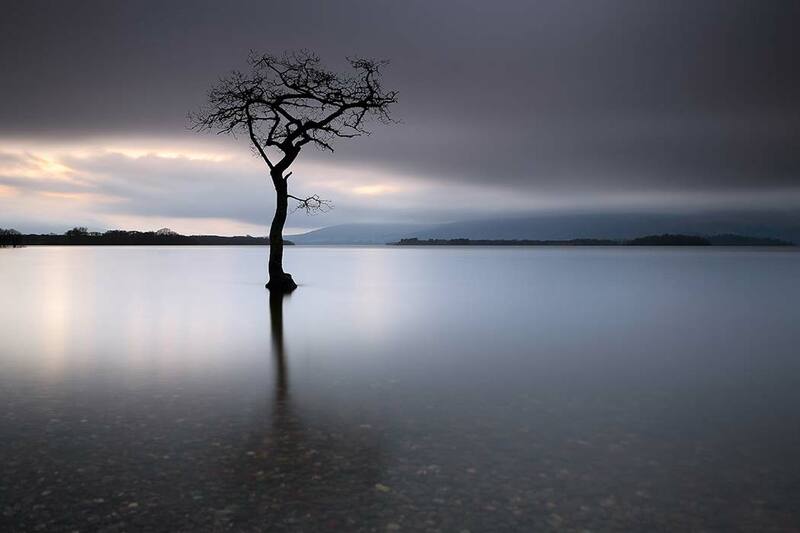 A lone tree partially submerged in the water of Loch Lomond. View on Portree before sunset. One of the cutest towns in Scotland. 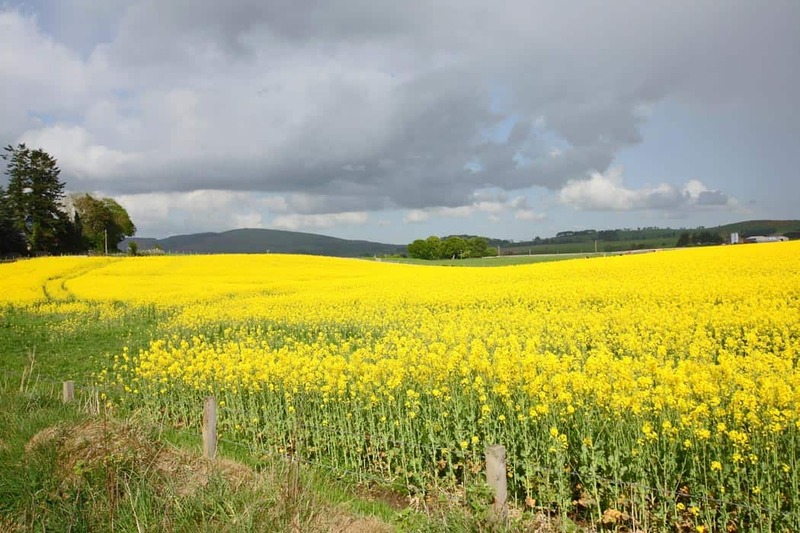 Rapeseed fields in Springtime. It looks a lot prettier than it’s name sounds. 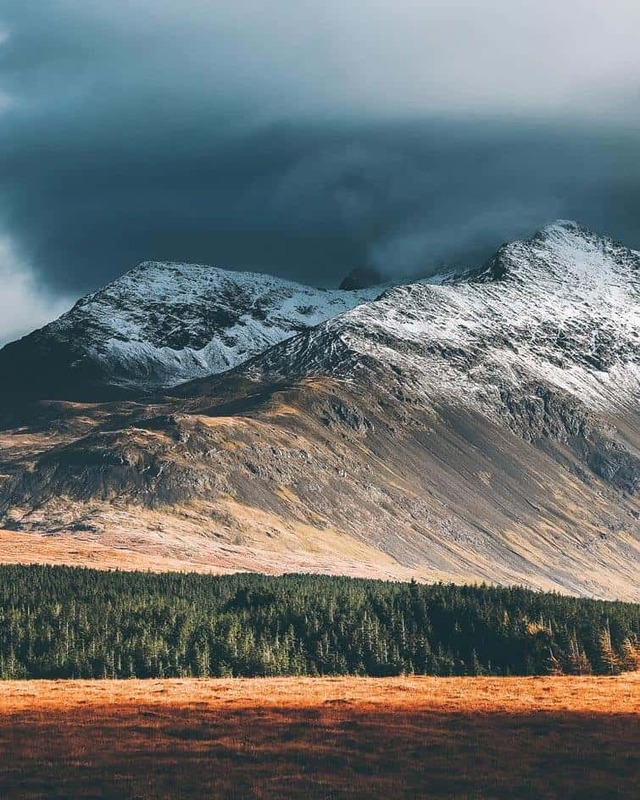 Alpine landscape in Cuillin Mountains. One more of the Scottish highlands. I’m officially drooling. 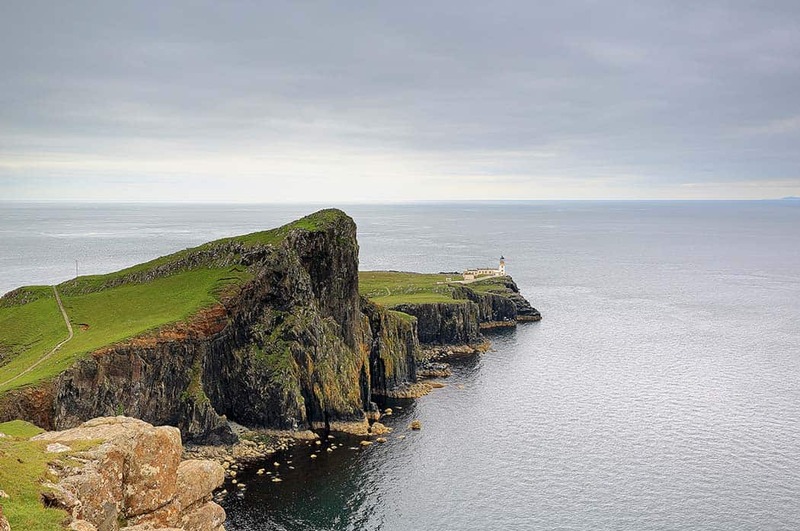 Neist Point Lighthouse and rocky coastline on the Isle of Skye. Edinburgh city view on a rainy day. 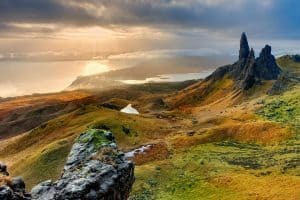 Have any of you been to Scotland? What would you recommend seeing? Did you enjoy seeing these beautiful photos? Here are some more posts on Europe you can explore. Planning a trip to London? Here are the 10 attractions we recommend not missing! 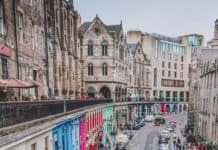 Edinburgh or Glasgow, Which City in Scotland Should You Visit? wow these are beautiful. I never think “Scotland” when I think beautiful landscapes- but maybe I should start. Haha, you’re comment literally made me laugh out loud! We should book a trip together!! I’m so jealous! I can’t wait to go. Wow! Just Wow! Beautiful! I have always wanted to go to Scotland. My grandmother emigrated from scotland many, many years ago and I am fascinated with visiting there and seeing where my family is from. Hope you have an amazing trip! Thank you Kara! And it is always fun to see your roots. I hope you can make it there one day! Wow, what a beautiful place!!! Definitely on my list to visit now! AHHH-Mazing! So beautiful! Thanks for sharing these! What lovely photos you’ve gathered! 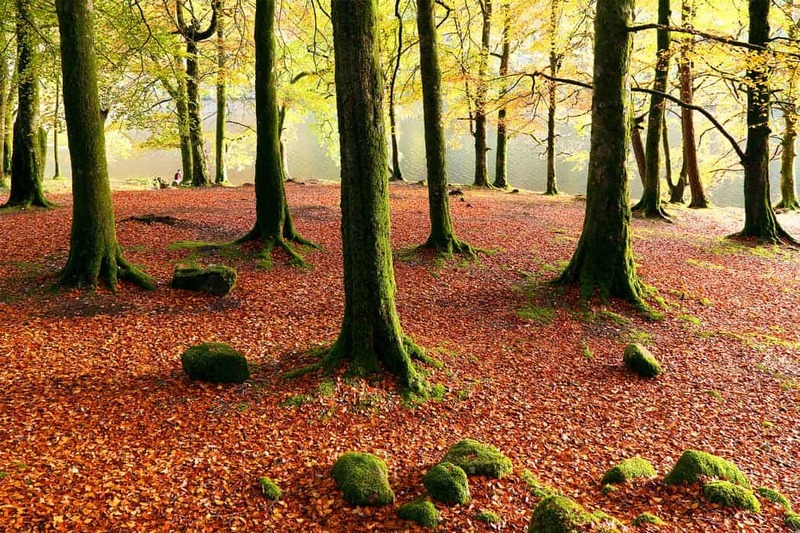 I haven’t been to Scotland, but Ireland is similarly beautiful. I hope you make it there soon! I’m so glad you like the photos! Thank you Carla! I am keeping my fingers crossed. 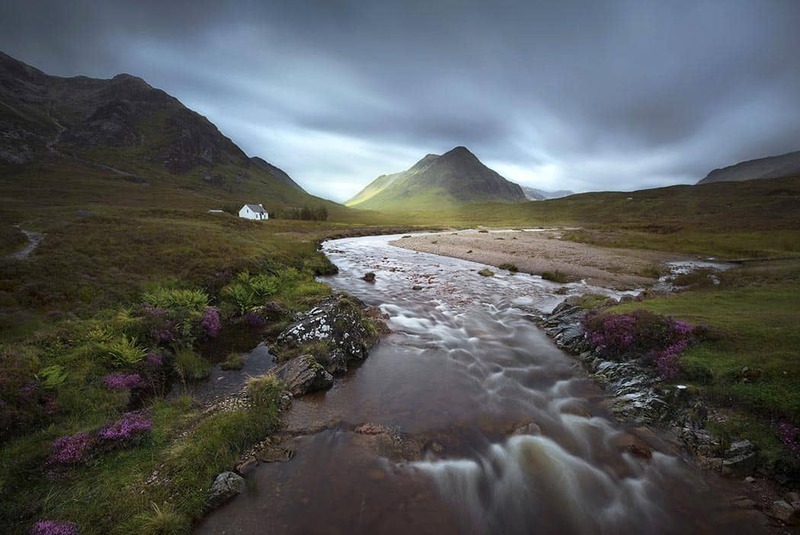 These are BEAUTIFUL and WONDERFUL photos of Scotland. I have been to Edinburgh, but it has been 11 years and I would love to return and see more of the Highlands. These photos are a great inspiration of where to go to when I make a return visit. Thank you so much Brooke! I seriously can’t wait to go! Hey Annika! Wow, good catch! Haha, I moved the photos around so much before posting I totally missed that. And I googled Dunnotter Castle and it is soooo stunning! I just love Scotland. Hey Corrine! You are awesome! Thank you so much for the tips. I just googled them all and you are most definitely right. Those need to be added to my list. My husband and I just got back from a 2 week driving tour of Scotland. It is by far the most beautiful place either of us have ever seen and we have traveled quite a lot. This was my dream trip. I thought about this for the past 5 years or so and it became a reality this September. I planned for months. I am into photography and wanted to go to these beautiful places. We flew into Glascow and rented a car and drove through the Highlands for the next two weeks, ending up in Edinburgh the last 3 nights before flying back to The States. Personally, we loved the smaller villages so much more than the cities. 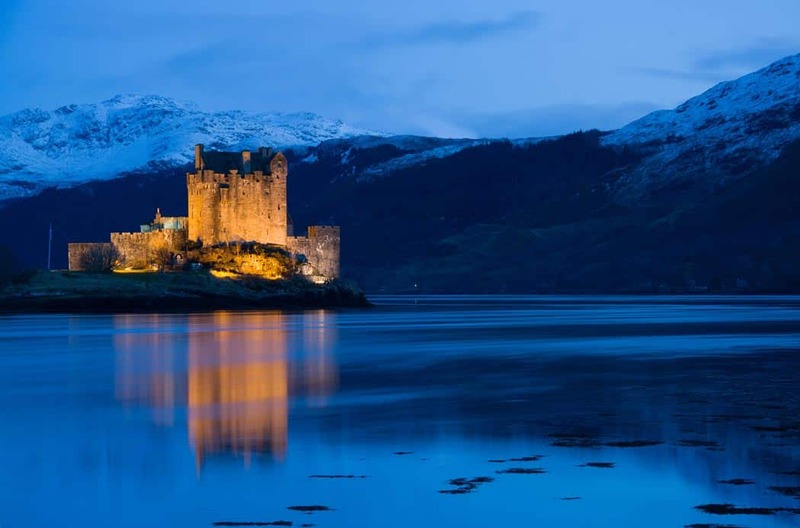 You must go to the Eilan Donan Castle. Incredible. 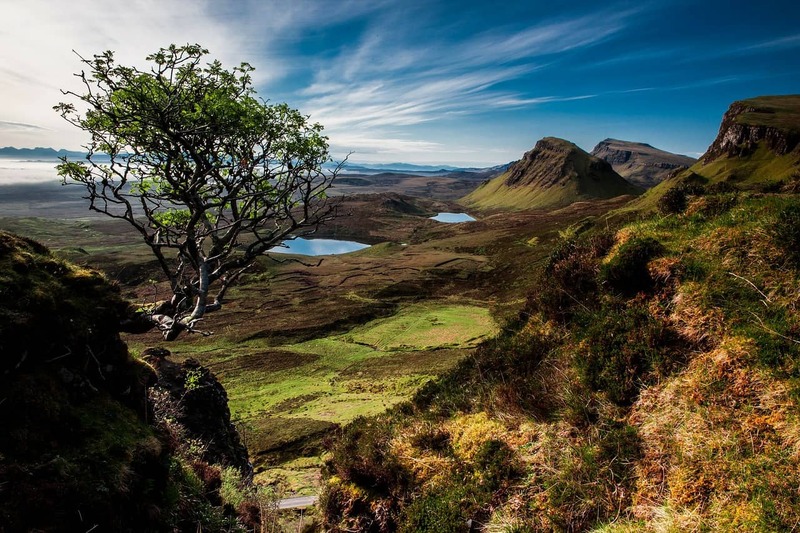 A few of the photos that you posted…well, while breathtakingly beautiful, unless you can hike, and in the case of the Old Man of Storr, you won’t see it. And the fairy pools? I “made” my husband hike with me to them and lets just say there is a lot of photoshop going on in that photo. I’m not trying to burst your bubble, honestly. Just telling you the truth so you hopefully won’t be disappointed like I was when you can’t see what you were hoping to see. Driving distances too much longer than expected because the roads are “one track” and very curvy with a lot of traffic sometimes. That was the reason we didn’t get to as many places as we had hoped but in no way did we let that stop us from taking in all the beauty Scotland has to offer. And the people….don’t get me started….the most warm, helpful, kind people you would ever hope to meet. Needless to say, I did not want to come home, and if I thought for one minute that I could get a job there….I’m outta here!!!!!! Please feel free to email me if you would like any information or to see some of the photos I took. Corrine was right, Pitlochry was one of my favs. Ohhh I want to go back right now!!!!! Wow, Thank you so much Ruth for all that amazing info! Sad about the fairy pools, but very good to know. Reading your comment makes me REALLY want to go now. We should be there in a few months! I will for sure email you as I plan out more details to get your opinion on things. Thank you so much! My husband and I went a few years back and we both LOVED it. Edinburgh is awesome and well worth a few days of your trip. One of my favorite parts of the trip was visiting Rosslyn Chapel, while my husband loved going to the William Wallace Memorial. I can’t wait to hear more about your trip! Thank you so much Natalie for those tips! I am also really glad your husband liked it…I hope mine does!! haha I will check out your recommendations! So here it is from a man. My wife and I spent all of 1985 living in Glasgow and it was the best year of our lives. Scotland has a beauty (sometimes sort of raw) that seeps into your bones and doesn’t leave you. And it’s not just the landscape. It’s also the people and the experiences (eg stumbling on enchanting B&Bs, going to the Edinburgh Tattoo. But don’t go in the winter – you won’t see this scenery – that is unless you stay a year and experience all the seasons! For however long you are there enjoy every minute – Scotland will reward you and in their words, you will “Haste ye back”. Loved your comment Tim! I wish I could stay for a year! This is one of the best blog post I’ve ever read! Furthermore I have to tell you that your blog is my favorite!! Keep going that way! Wow, thank you so much Irene! Your comment made my day. :) I am so glad you are enjoying the blog. 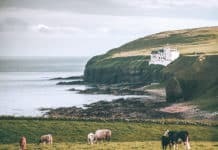 I went to Scotland and Ireland at the end of Aug. and beginning of Sept. Ireland has always been my first love and dream trip, Scotland was the bonus part. I LOVED LOVED LOVED Scotland!! Even more then Ireland. Getting to frolic on Heather covered hills was amazing. The light there is just different….magical somehow. It’s hard to take a bad photo (even just using an iPhone camera). The scenery is spectacular! It was so much prettier then Ireland. As someone above stated, the People!! They were so NICE, open, friendly and so helpful. Especially the older generation. I to, would’ve stayed on if I could figure out how to live and get a job there. I’m saving up so I can go back!! Hey Heather! You always hear soooo much about Ireland that I think Scotland gets over looked. I am so glad you commented because now I am thinking we may spend an extra day or so in Scotland than we had planned. Thanks!! Hi, did you have your trip to Scotland? I live here and the photos are marvellous and real life just as breathtaking. There are a few places I’d recommend. My town is called Lanark its in between Glasgow and Edinburgh and about 30 miles south of both its steeped in history. William Wallace lived here and married Marion of Braidfute here. Robert the Bruce did too. It is known as the Royal Burgh of Lanark and dates back to 1142. Also we have a World Heritage Site which is know as New Lanark (it’s over 200 years old but i guess that’s new compared to 1142!) it was developed by industrialist Robert Owen and is stunning? It runs along side the Falls of Clyde which are simply breathtaking. I’d be happy to show you round. Ok so I’ve ‘bigged up’ Lanark somewhat…the other place are( Rest And Be Thankful (yes that is its real name) it’s on the west just passed Loch Lomond and it is a lovely beauty spot. also, the Drumochter Pass is mind blowing its scenery is so severe and the road looks different when you travel both directions due to the rugged and sheer rock faces. Culzean (pronounced cullaine) Castle on the Ayrshire Coast is an amazing Castle which is in pristine condition and open to the public it is on the cliff edge and has beautiful gardens. There is an the apartment at the top of the castle given to General of the Army Dwight D. Eisenhower in recognition of his role as Supreme Commander of the Allied Forces in Europe during the Second World War. The General first visited Culzean Castle in 1946 and stayed there four times, including once while President of the United States. It is now a hotel and you can spend the night in his apartment! Have a fabulous time, we are a very friendly bunch! But I’d swap it to live in America in a heartbeat, love your people, culture, attitude to everything. Of course it would have to be somewhere warm and sunny year round like Florida or California!! No uses swapping rain for rain haha!! Wow Alison! Thank you so much for commenting on this post! We have not yet taken the trip to Scotland so we will have to take some of your tips to heart. I have heard nothing but AMAZING things about Scotland and it’s people so we are beyond excited to take the trip in the next few months. I have been to Scotland many times. I’m married to a Scot. 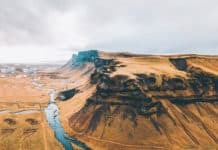 These photos really do show it at it’s best – but the truth is that it is REALLY just like this – an utterly stunningly beautiful part of the world! I would add photos of the Hebrides too. I want to go there right now!!! Thanks for the tip on the Hebrides! I had never heard of them and just looked them up…AMAZING! I live in Scotland (near the hermitage actually) and I can safely say it is one of the most beautiful places in the world, I hope you enjoy your trip here !! Hey Megan! I am so jealous you live in such a beautiful country. Thank you so much for your comment! My daughter and I took an amazing 3 week trip in 2014, to Ireland, the U.K. and Paris. Scotland was our favorite by far. Edinburgh has so much to offer! Hiking, site seeing, shopping. We are going back this summer after she graduates from high school. This time we are taking my husband and son. Scotland is amazing! And it’s not overrun with tourists like London, Bath, Paris. It will be a great way to introduce international travel to my guys :) Edinburgh is our most favorite city we have experienced so far. Can’t wait to go back! It is so exciting to hear all my readers speak so highly of Scotland! I feel like it gets overlooked a lot which is too bad. I have to admit though, I am surprised to hear so many people tell me they liked Scotland better than Ireland. It just makes me that much more excited for our trip! I lived in Scotland for 6 months (in the middle of nowhere) and visited many times before and after. It’s one of my favourite countries in the world! Thank you so much for your comment! I am so happy your boyfriend loved it! It gives me hope that my husband will. We have had to delay this trip so many times because I have had health problems but I am hoping we will get there in the next few months. I couldn’t be more excited! Im curious, how did you like Glasgow Johanna? Is it worth a visit when we go? Hi Claire, I live in Ayrshire, about 30 miles from Glasgow. It really is a great city, but often overlooked by tourists in favour of Edinburgh. It isn’t as visually beautiful on first glance, but if you look up when you’re in the centre there are some beautiful buildings, there is also lots of brilliant museums, bars and restaurants. Arran is a lovely island, that isn’t too far from Glasgow, they call it Scotland in miniature. Oh awesome Lynsey! Thank you for the tips on Glasgow. Also, I am excited to check out Arran island. I have never heard of it before! Thank you so much! I am so glad that I have readers from Scotland that are willing to give such good tips! Nothing better than hearing travel tips from someone who is from there. Great blog post and great comments! 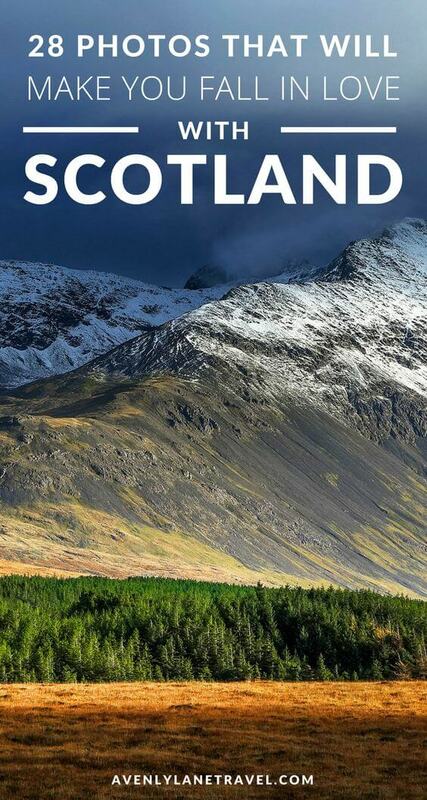 As a born and bred Scot I am proudly patriotic and love my beautiful country! I’ve often said I’ve visited many places in the world but the scenery and food in Scotland is the best! 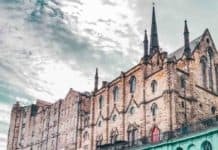 I live in Glasgow but have lived in many part of Scotland, I would definitely take in Glasgow for a different experience of what Scotland has to offer. Great shopping (best outside of London apparently! ), restaurants/ nightlife (both city centre & funky west end areas), not to mention the fantastic range of parks we have (pollock park which was voted best in Europe and has the fantastic Burrell collection museum and its own herd of Highland cattle, (google them, they are so cute!)) and kelvingrove park with nearby kelvingrove museum and art gallery (favourite childhood haunt of mine). We also have some great architecture throughout the city, with the famous Charles Rennie Mackintosh school of art, lighthouse building & house for an art lover to name a few. Glasgow cathedral and the atmospheric necropolis (old cemetery) are also pretty impressive! The new museum of transport and the Glasgow science centre are also great attractions especially with kids on a rainy day. I live in scotland, it truly is just as beautiful as it is in the photos. There’s no need to go anywhere else, we have it all! You are so lucky to live there. Photos can sometimes be deceiving and make a place look better than it actually is, so it is good to hear that with Scotland that is NOT the case. :) I seriously can’t wait to get there myself!! I was fortunate to visit Scotland and The Highlands a couple of years ago. There are so many nooks and crannies to explore and as one other comment stated, it would be almost impossible to take a bad photo. I would highly recommend a few days on The Isle of Skye. We rented a vrbo in Portree and it was a perfect jumping off place for the entire area. Even though I’ve been, I’m jealous and would go back in a minute. Can’t wait to read about your experiences and see your photos. Hey Carol, I am glad to hear that Portree was a good jumping off place because I really wanted to check out the town there as well. Man, you guys just make me even more excited for our trip! Ahh, I can’t wait. Thanks for your tips! Well, I am sort of biased, but if you go to Skye, be sure to see Dunvegan Castle, the oldest continuously inhabited castle in the British Isles. And home of Clan MacLeod. If you like whiskey, the Talisker distillery, also on Skye, is memorable. Go in August, and see the Royal Edinburgh Military Tattoo inside Edinburgh Castle. 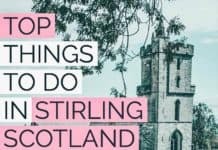 See Stirling Castle. Nearby is Stirling Bridge, where William Wallace (Braveheart basis) won Scotland’s independance. It’s a marvelous country, and probably nothing like you will expect. Hey Scott! We actually may be there in August so these tips are great! I seriously want to see the Dunvegan Castle now. I had no idea it was the oldest inhabited castle in the British Isles. Awesome. Have been in1997…. really wonderful…would have liked to spend more time in northern area West of Inverness….loved to visit thé fort…yes Isle of Skye is great and also quiet time on coastline. Thank you so much Ellen! We will for sure. Sounds like your trip was amazing! Ah, I can’t wait! I am still waiting for my health to improve before we go but I couldn’t be more excited. Thanks for the tips Anuj! Inverness is on my Scotland bucket list for sure! Thanks Carla! I live in Scotland ( near Perth) and everyone heads to the world renowned Edinburgh Festival which runs for the month of August. Theatre, art, music, street performance, food, it’s fantastic. Just stroll around the city and soak up the atmosphere. There is something for everyone! We actually may be there in August! Thanks for the tip, well have to check it out! My husband and I are going to Scotland and Ireland in September for 24 days. Can’t wait. Thanks for the good tips. Wow, sounds like that will be 24 days of pure heaven. Me and my husband have been planning a similar trip. Will you guys be exploring the Scottish Highlands as well? The photos here are just breathtaking! I really enjoyed viewing them. My husband and I just returned from Scotland 2 weeks ago. We saw many of the sights you have photos of but we also took a day tour over to the Orkney Islands. Skara brae is a must see! It was truly amazing. We also visited the Ring of Brodgar stone circle, the city of Kirkwall – with the Bishops & Earls palaces along with St. Magnus Cathedral – Scapa Flow and the Italian Chapel. It is a beautiful island and a bit different than on the mainland of Scotland. If you get the chance, I would recommend it. Of course you have to take the ferry from John O’Groats, which is an adventure in itself…but it was worth it!! Orkney Islands?! Skara Brae?! I have never heard of those places but now I HAVE to look them up! You have seriously given me so many more things to see in Scotland, I think we will have to extend our trip. Haha. Thanks for the wonderful tips Hope! Visiting Scotland was my childhood dream ,this June I was there in Edinburgh with my husband and we really soaked ourselves in Scottish fairyland.We just walked and walked to all the beautiful locations in this city . Scottish are so kind and helpful .The princess Street,the Scottish monument Waverly station,rose street ,Carlton hill and The Royal mile a must visit.We did go to the Scottish Highlands,beautiful and breathtaking.In the evening Edinburgh castle glows in its full charm. It seriously sounds so magical! Ahhh. I can’t wait for our trip. Thanks for the recommendations of what to see in Edinburgh, we will definitely hit all those spots!! 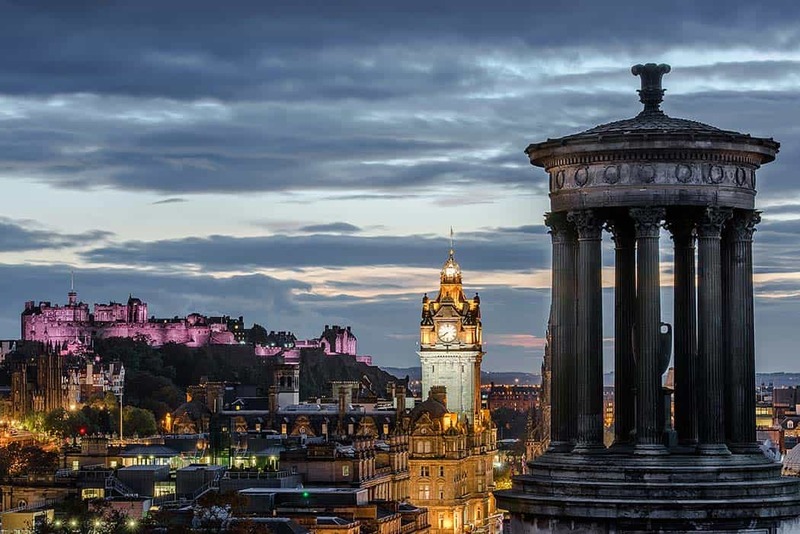 How long would you say we need in Edinburgh to see all the must see spots? Hi Margaret, you have beautiful photos and are obviously extremely talented but please do not come to my blog and immediately accuse me of stealing your photos, especially when you sell them as stock photography. I have purchased these photos through a stock photography site that does not require attribution. Again, I payed for them. Had I known you would accuse me of stealing I probably would not have purchased your photos. If you want to be given credit for the images then you should not sell them as stock photography. My license agreement states I do not have to give credit since I purchased the images. I am so glad you liked it! This post was part of my Scotland trip planning, haha. I hope we get to visit all of these places when we go this year! 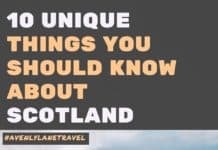 If I were you I would definitely add to my list those two: Mealt Falls on Isle of Skye and Dunnottar Castle which is located not far from Aberdeen. Anyways, it doesn’t matter which one u will chose cause there are so many beautiful views in Scotland u will see on the way! I definitely recommend☺️ It’s my favourite place in UK so far. Howdy! I could have sworn I’ve been to this blog before but after reading through some of the post I realized it’s new to me. Anyhow, I’m definitely happy I found it and I’ll be book-marking and checking back frequently! My husband and I went to Scotland in April this year. Glencoe, The Trossachs, Stirling, Edinburgh, St. Andrews. We stayed 2 nights at an amazing B&B, No. 20 Boutique B&B. Wanted so badly to go to Fingal’s Cave but the boat tour got cancelled due to poor weather. It was a fabulous trip. Our first time out of the states (other than Canada :-P). Can’t wait to go back someday and explore more. Check out this blog: Traveling Savage. So much info on Scotland. What a bummer your boat tour cancelled! There are so many amazing spots in Scotland it is driving me crazy that we won’t have time to see them all. I will definitely check out that blog! Thank you so much for your recommendations Rachel! 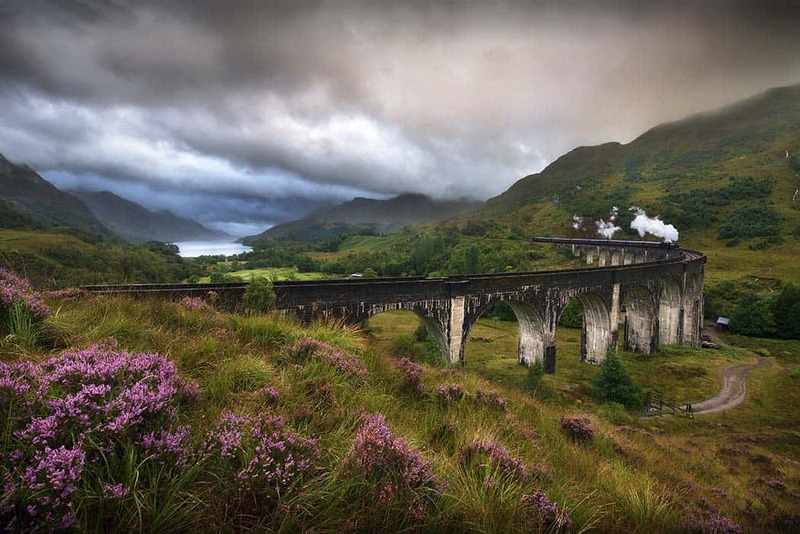 Is the passenger train still going through the Glenfinnan Viaduct? I would give everything just to take the train there! Thank you so much Monika! I am so glad you liked the photos. Hi, Claire. Great blog site! Scotland is such a beautiful country you are sure to be enthralled – I’ve been twice and hope to return again soon. I have traveled to many parts of the world, but Scotland holds a special place bcs of the landscape, people, history and heritage (ancestral homeland). 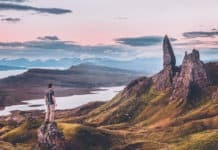 As a photographer and hiker, my purpose for traveling to Scotland was to capture iconic images (many of the same scenes you have posted here) and to hike in the mountains of the Western Highlands and Isle of Skye. 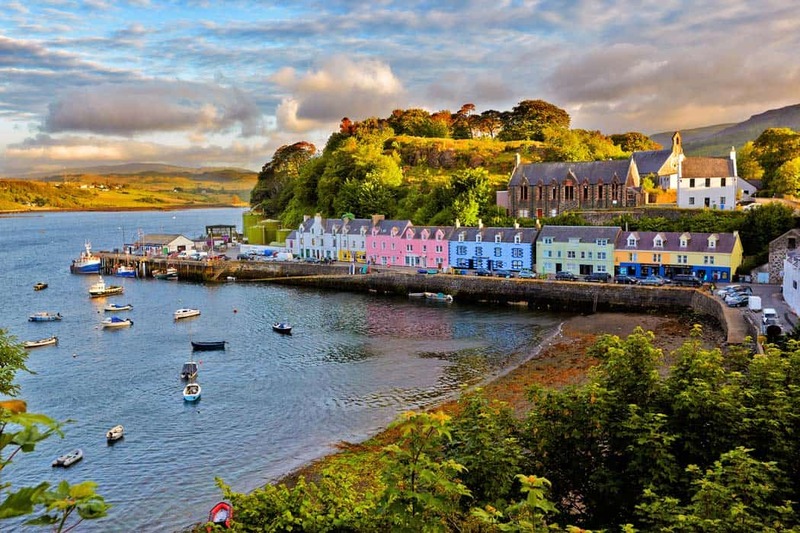 I found Portree to be a great base for seeing all of Skye (it will be incredibly busy with tourists in August), and also a wonderful boutique hotel near Eilean Donan Castle at Kintal, appropriately called Kintail Lodge. Kintail is a great place to hike a number of the mountains in the area of Glen Sheil. Perhaps you should challenge your husband to hike the Five Sisters of Kintail, where the trail begins just a short walk from this lodge. On Skye there are many hiking trails in the valleys and across the Cullin. Driving anywhere on the island is easy. Be sure to visit Talisker Bay as well, as there is an amazing waterfall there where the water may be pushed back up the cliff edge by the wind. Finding the right location on Skye at the right time of day for photography can be a bit tricky . To help with this, Marcus McAdam (www.marcusmcadam.com), an award-winning photographer on Skye, has produce a small booklet to guide you to the locations and give insights into how to best view and photograph these places. I was fortunate to go out with Marcus on shoots for a couple of days, and also used his booklet throughout my stay. The Edinburgh Fringe Festival is well worth seeing, which runs through August. Great entertainment and fun to chat with the performers. Also lots of small, quaint villages in the countryside, both in the north and closer to Edinburgh. Scotland is by far my favorite country- it stole my heart and has not given it back. I was lucky to visit and photograph many of the locations you have here. I also had to convince my husband to go and in the end he loved it almost as much as I did. Something he really loved was doing archery and axe trowing we did in Skye as well as all the amazing hiking. I know your trip will be amazing as well. Hey Donna! I totally forgot to update this post, we just got back a few months ago from Scotland. It really was the trip of a lifetime! Thank you so much for your comment. I am so glad you loved Scotland as much as we did!